Kerala is known as the Spice Garden of India. But, other than that, particularly during the early 1980s, it is not popular to tourists unlike the other states in India. Things changed when its government decided to make efforts in promoting tourism in the state of Kerala. Its tourism then skyrocketed particularly in 2006 and 2011. Kerala uses the tagline God’s Own Country since they believe that the state is truly blessed. Thus, they assume the obligation to share those blessings with people from other parts of the world. 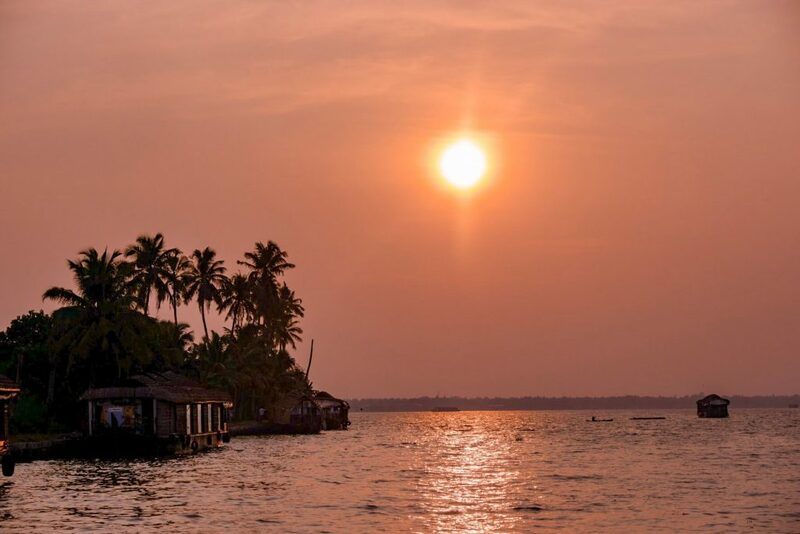 Kerala boasts, among others, the authentic Ayurveda treatment, idyllic hill stations, local cuisines, diverse people, wildlife sanctuaries and serene golden sand beaches. 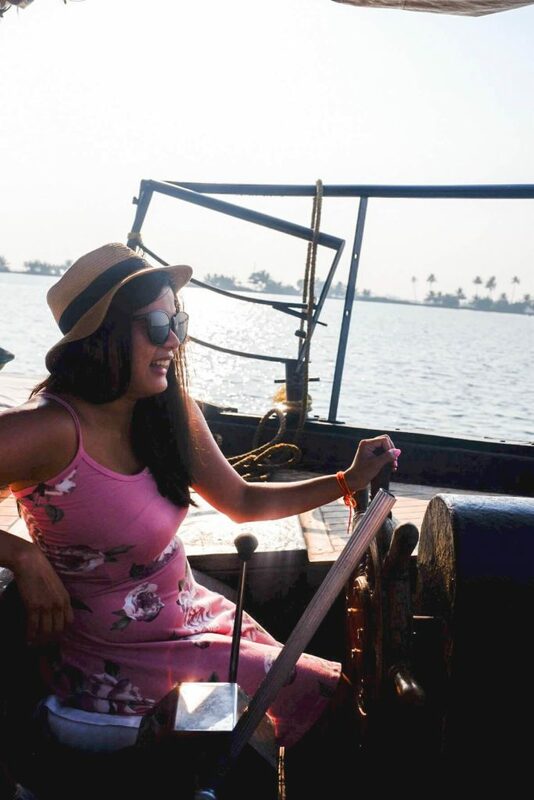 And, then, definitely, Kerala boasts its backwaters where you can enjoy a day or an overnight cruise. Backwaters are composed of interconnected lagoons, canals, and rivers. A number of traditional houseboats traverse along the Kerala backwaters. 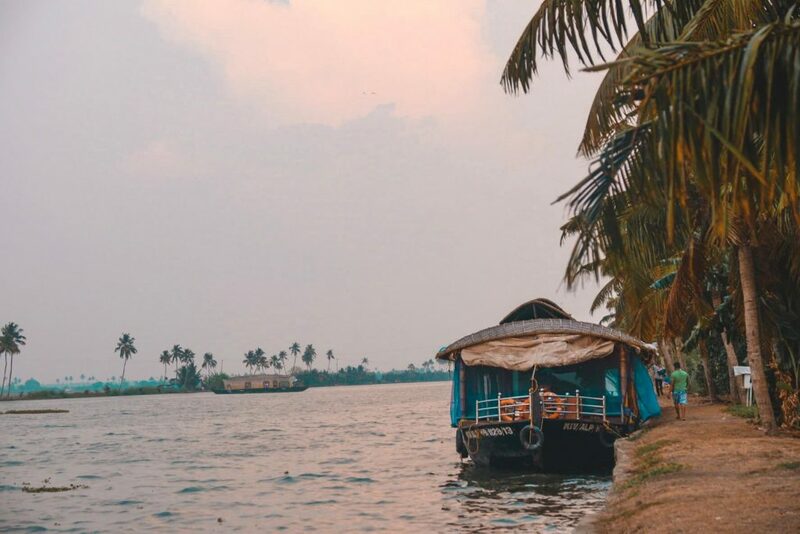 The houseboats symbolize a portion of the history of Kerala as well as its unique culture. 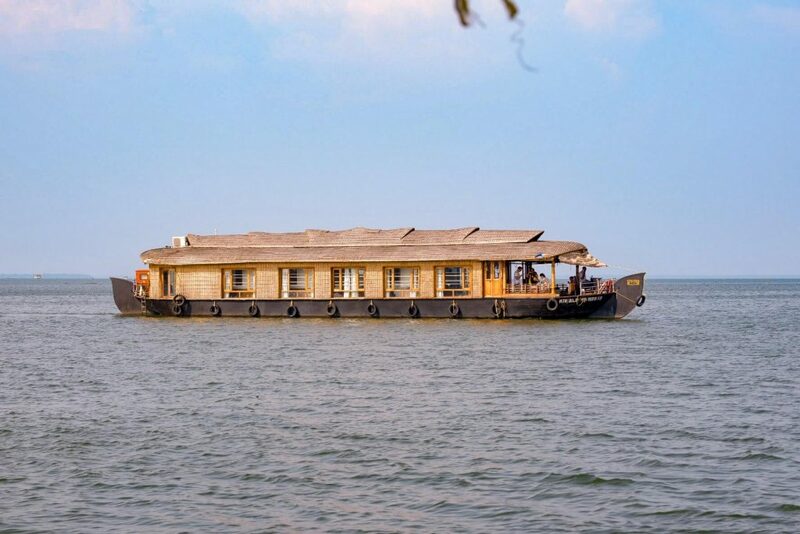 Alleppey houseboat cruises often start in the city of Allapuzha. Some refer to it as Alleppey. Others say it is the Venice of the East. 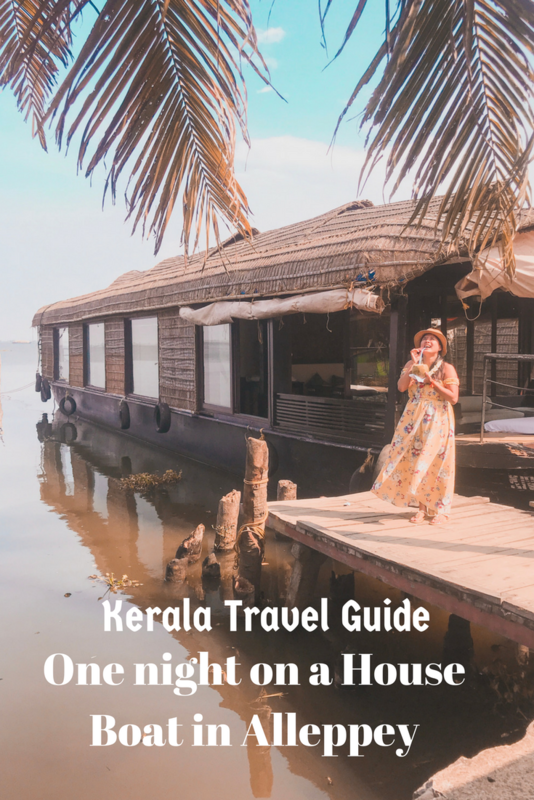 In this article, you’ll be able to know the things to expect in Allapuzha, my personal experience, some fun facts about the traditional houseboats, and the directions to reach the place. 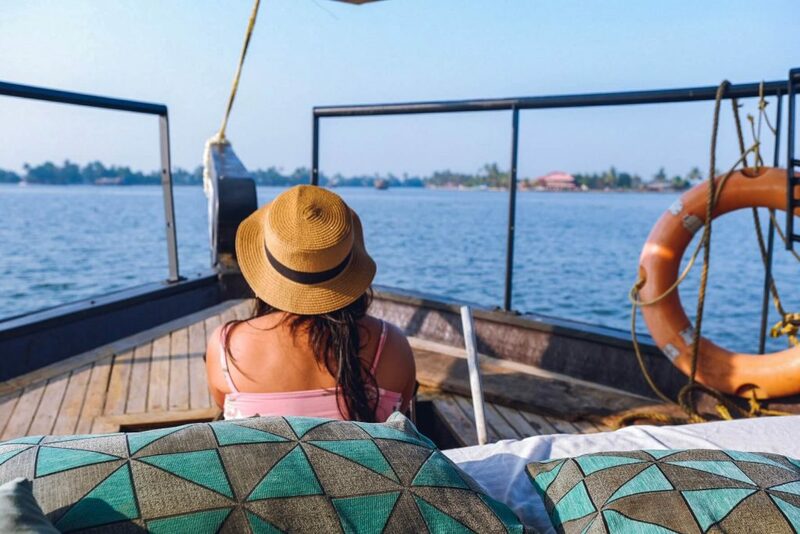 If you’ll be coming from north India or outside Kerala, the easiest and fastest way to get to Alleppey is by taking a flight going to its nearest airport, the Cochin International Airport. 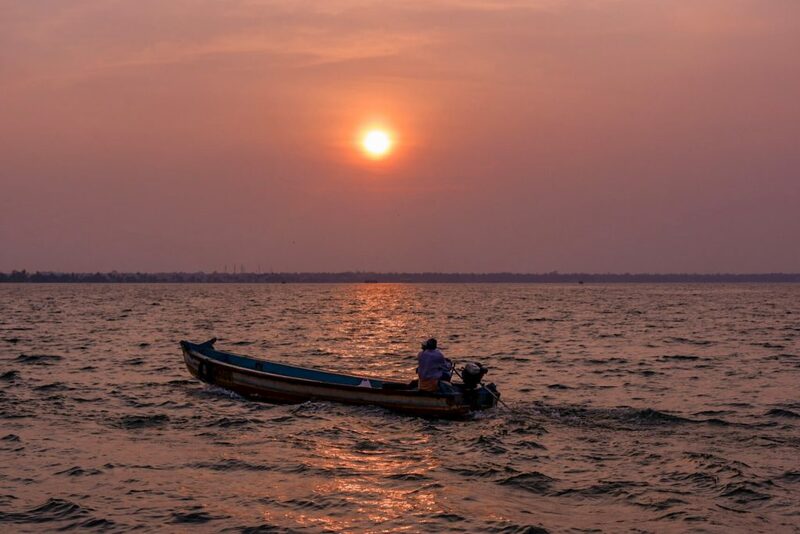 From there, you can ride a prepaid taxi or bus heading to Alleppey. Bus fare from Cochin to Alleppey ranges roughly around INR 48 to INR 121 (Php 38.23 to Php 96.38). Prepaid taxi fare from the airport ranges from at least INR 2,300.40 to INR 2,570.40 (Php 1,832.31 to Php 2,047.37). The travel time from the airport to Alleppey is at least two hours. An alternative way from Cochin to Alleppey is by taking a train. So, from Cochin, you ride a taxi going to the railway station, either in Ernakulam Town or Ernakulam Junction. Ernakulam Junction though is bigger. Travel usually takes two and a half hour. If you’ll be coming from the south, the nearest airport is at Trivandrum International Airport. Here, you can also ride a prepaid taxi or bus going to Alleppey. Bus fare from this airport to Alleppey costs around INR 150 (Php 119.48). Car rental or taxi fare can cost around INR 3,600 (Php 2,867.46). The travel time from the airport to Alleppey is more or less three hours. You can also ride a train at Trivandrum Central which is only more or less 20 minutes away from the Trivandrum International Airport. Both Thiruvananthapuram Rajdhani Express and Kozhikode – Thiruvananthapuram Jan Shatabdi Express pass by Alleppey. Other trains pass through Kottayam instead of Alleppey. 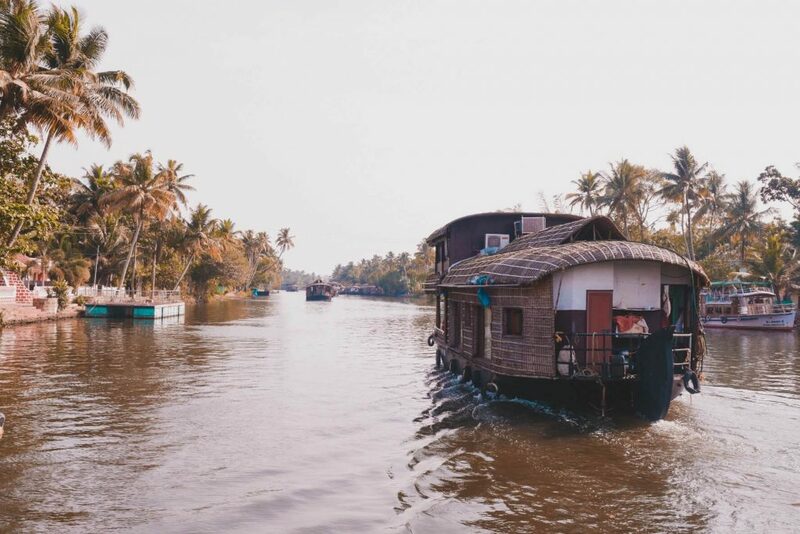 Way back before the invention of vehicles and construction of roads, people in Kerala used houseboats to ferry their goods and passengers to and fro the main trading centers along the backwaters, among others, Alleppey, Cochin, and Kottayam. The goods were often the spices and rice. So, sometimes they refer to these as rice boats. Sometimes, they refer to them as Kettuvallam. It originated from the words “kettu” meaning “to tie” and “vallam” which means boat. Rather than using nails, they used the coir rope made out of coconut to tie the wooden planks to form the body of the boat. They then coated them with black resin which is made from cashew nut shells they boiled. To steer the boat, they used bamboo poles and oars. You can imagine how long it took just for them to cross the backwaters. But, hey, these traditional rice boats are durable that most of them are already more than a hundred years old now. Since passengers and business owners prefer land vehicles and train, Kettuvallam was almost phased out. But due to its historical and cultural values, people in Kerala will not merely be disposed of the Kettuvallam. The traditional boathouse underwent improvements in order to make them appealing and comfortable lodging for the tourists. 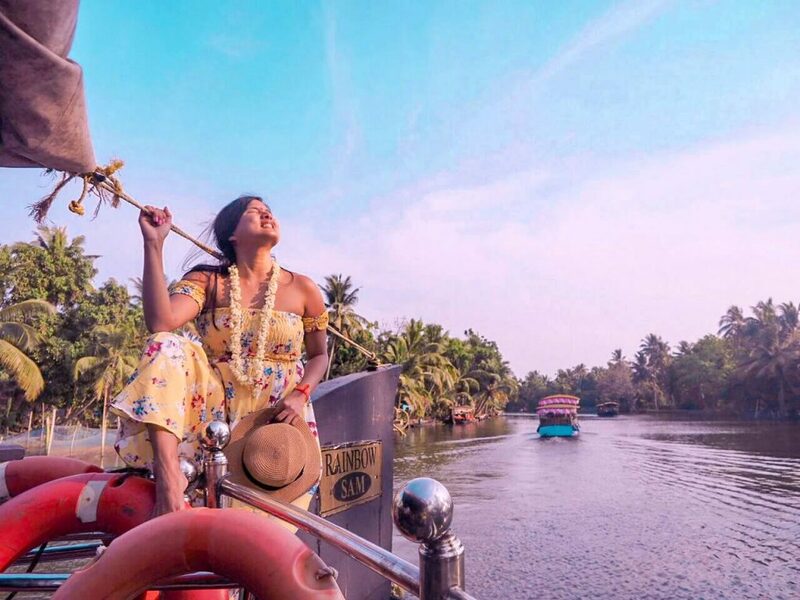 In order to ensure the protection of the tourists, quality of the services offered by houseboat operators and environmental protection of the backwaters, the Kerala State Tourism Department provides the classification of houseboats used to promote tourism in the region. The houseboats are classified as Gold Star, Silver Star, and Green Palm. Green Palm is given to houseboats that meet the eco-friendly standards set by the government. The Silver Star is given to those who meet the essential requirements. And, the Gold Star is awarded to those who adhere to optional requirements. Rainbow Cruises, our host for our houseboat experience, has gold star certification. Their fleet of houseboats is composed of three types of houseboats which are Luxury, Premium, and Deluxe. After our first day in Trivandrum for Kerala Blog Epress, we headed to Allapuzha. We We were separated into 4 houseboats — all being the luxury ones. We were assigned to Rainbow Cruises. Rainbow Cruises has a lot of boats, some have twin beds and some have matrimonial beds. Manoj, our awesome tour guide, asked us to do draw lots. Tasha, my roomie, picked single beds so it was just the two of us on our luxury boat while the others shared in the other boat. The boat had a big sitting area where people can hang out. Of course, we preferred to bond with more people , after all, it’s only getting to know you stage in our trip, we had wanted time with others. We had lunch in our respective boats and then hang out in one boat after. We returned to our own boats for bedtime. Meals are provided for in the Allepey houseboat. Both lunch and dinner are home made type of food which I liked. It felt very intimate as well, just us 3 ( Tasha, Manoj and I ) or our boat. We were lucky we had Manoj since he began by teaching us how south indians eat and explaining each dish to us. It’s easy to be vegetarian and live in India. My roomie, Tash was vegetarian and I believe that she still had a lot of options to choose from . After eating, we all moved to one boat with the rest of the crew. We chilled, danced, sang and just bonded while appreciating the awesome view of the backwaters. The sunset was amazing. The pathways were spectacular. It was interesting to watch life around the backwaters. The boat docked for sunset. No, you don’t run through the night they dock somewhere — our other friends got rice fields and whatnot (lagoons and lakes) but we ended up in a place with coconut trees and still an awesome view of the sunset and life of the villagers. The next day, we left at 8 to make it back by 9. I asked why they had to dock by 5 or 6 pm — it’s to give way to fishermen and to avoid destroying the nets. So, you see early morning around 5 to 6 the fishermen are on their way back as we started to have breakfast and make our way back to the jetty to catch our bus. Nice way to live. As we sailed in the morning, we witnessed village life of Kerala — like the kids waiting for the boat bus to take them to school. Similar to a floating market style, people approach the boat of fishermen to buy the fresh catch of the day. It was unique and really nice seeing how everyone lived along the backwaters — children just playing by the side, swimming and what not. I loved it. I got the chance to drive the boat too. Gosh, didn’t know why he let me but it was fun. 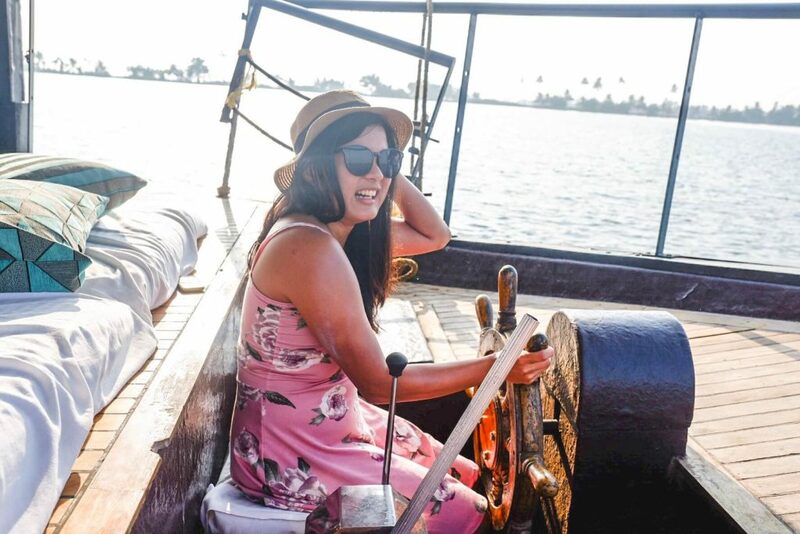 I loved the Kerala backwater experience. I was told that you can stay longer than overnight and stretch itineraries and activities. You can even go kayaking as well. Honestly, I would try this again next time since this was one of my trip highlights. 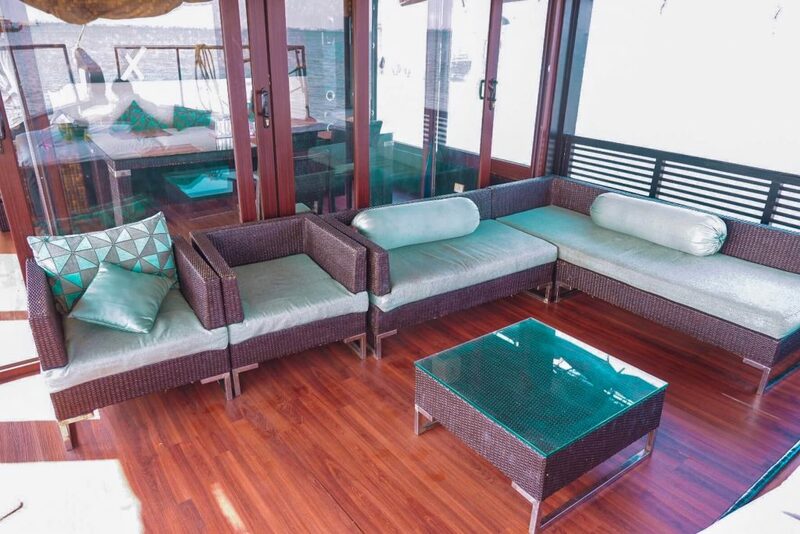 Basically, their houseboats have one up to four bedrooms, separate bathrooms for the crew, common areas, and kitchen. Meals ( Lunch, Dinner and Breakfast ) are all covered. 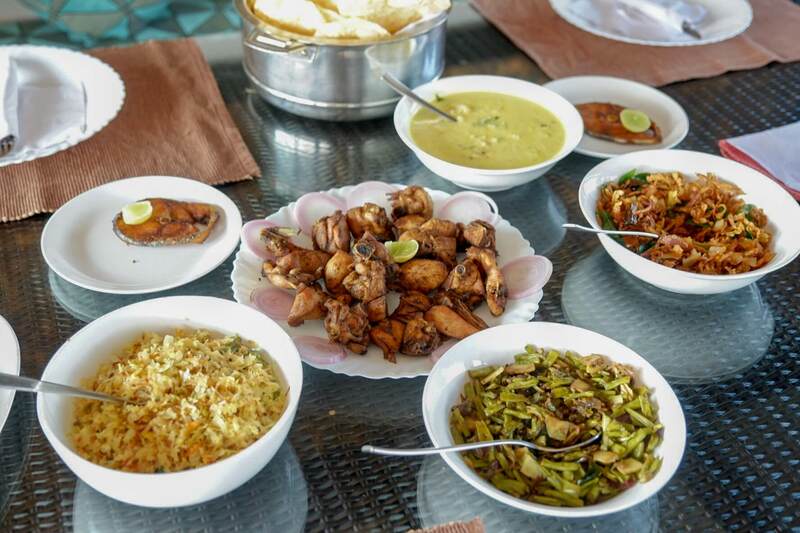 The in-house chef will be serving mainly exotic Kerala Cuisines. They have electricity. Houseboats basically have lights, TV, and aircon and/or electric fan. There are also electrical outlets where you can charge your gadgets. They may not have hot water in the shower but the bathrooms are fairly decent like a typical hotel on land. There could be houseboat traffic since we passed through some narrow waters. We occasionally got to say hi to the people along the shore. 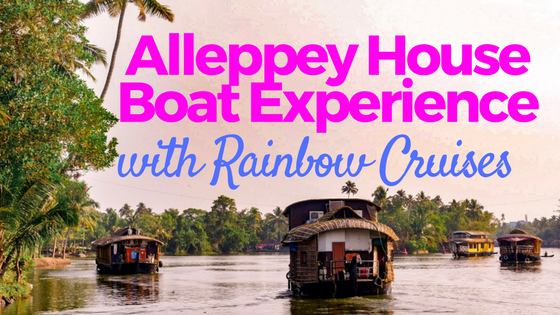 Rainbow Cruise houseboats, like the other operators, start the cruise at the Alleppey, specifically at Punnamada Lake. This is where the annual Nehru Trophy Boat Race is held every second Saturday of August. It is a race event particularly for snake boats or those long canoe boats. Keralites are actually fond of snake boat races that they held them for almost all throughout the year. The major races are usually held during Onam, their annual Hindu festival which then often falls between August and September. By 12 noon, guests will be checking-in the houseboat. You will then be served with a lavish lunch meal. 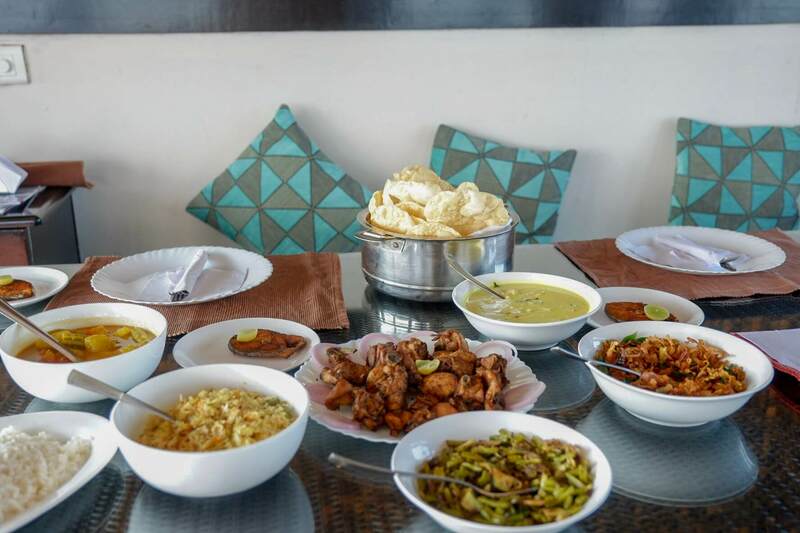 Around 4 PM they will serve coffee or tea with Keralite snacks like banana fritters or boiled cashew nuts. They’ll never let you go hungry. The houseboats will dock around 5:30 PM as required by the law to give way to the fishermen and to avoid hitting the fishing nets. Guests can have the chance to walk around the nearby villages and along river banks. Some guests use this time to go kayaking since the kayak is just small and can easily avoid the fishing nets. A pilgrim center for Buddhist is also located along the narrow backwaters of Alappuzha. This is the Karumadi Kuttan where you can find the 11th Century old Buddha statue made of black granite. You may tip the crew if you are happy with how they served you. This was one of our first activities during the Kerala Blog Express and it was often named as a highlight for everyone. It was a good way to start our road trip around Kerala. Maybe next time, I can explore other parts of the the backwaters too. I was closely contemplating of including that in this post —- the video I mean. I just turned it as a highlight in my IG. Super loved to have shared this experience with you . 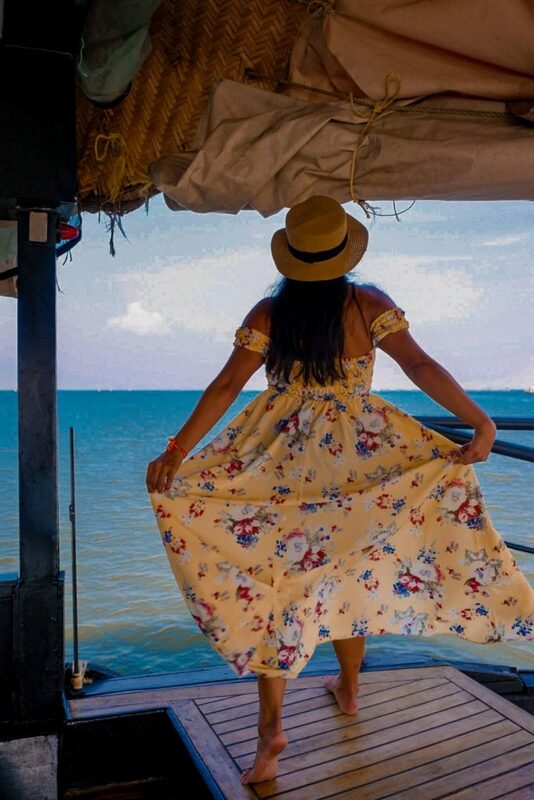 I’m from Kerala, and my mother’s family is from one one the islands in the backwaters of Alleppey (the place is called Alappuzha nowadays, which was always the Malayalam name). I still remember getting on a boat to get to my mom’s ancestral place. Thank you for bringing back some cherished memories. What a lovely experience this must have been! I feel so peaceful after reading this, and seeing your wonderful photos of the boat, food, and colours of the sky and water. Kerala looks like a lovely place to see in India; hope I make it one day too! 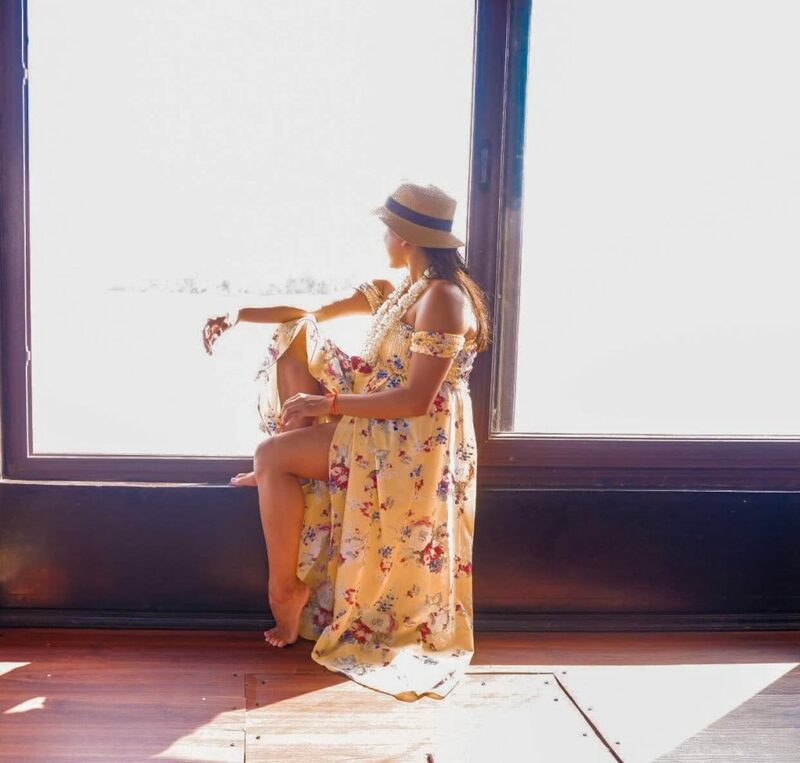 What a wonderful and memorable experience, Karla! Your photos are lovely and I am sure you will cherish this experience for a long time. We had been to Alleppey around 10 years back and had loved it. Never got the chance to go back again. Looking at your photos I feel I should plan another visit soon. 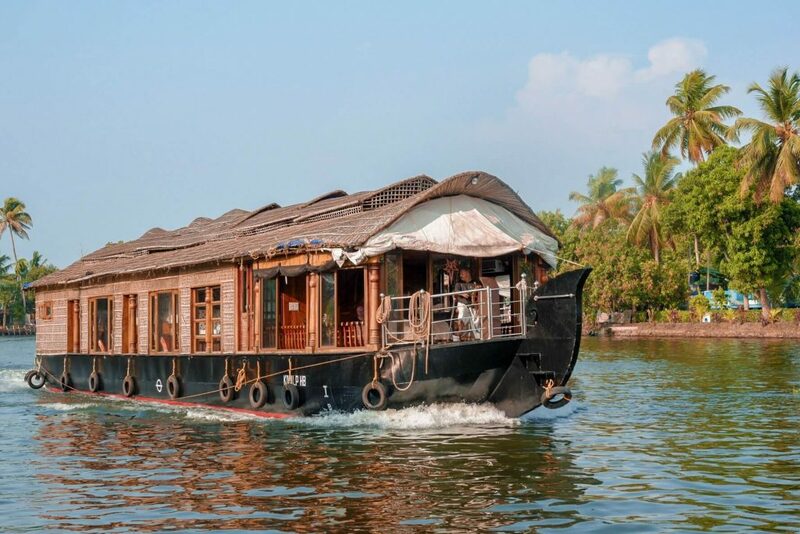 I really want to visit Kerala and stay in a houseboat. It looks likes such an amazing experience. It’s great that you get to witness the daily lives of the locals too. It makes the experience so much more authentic! 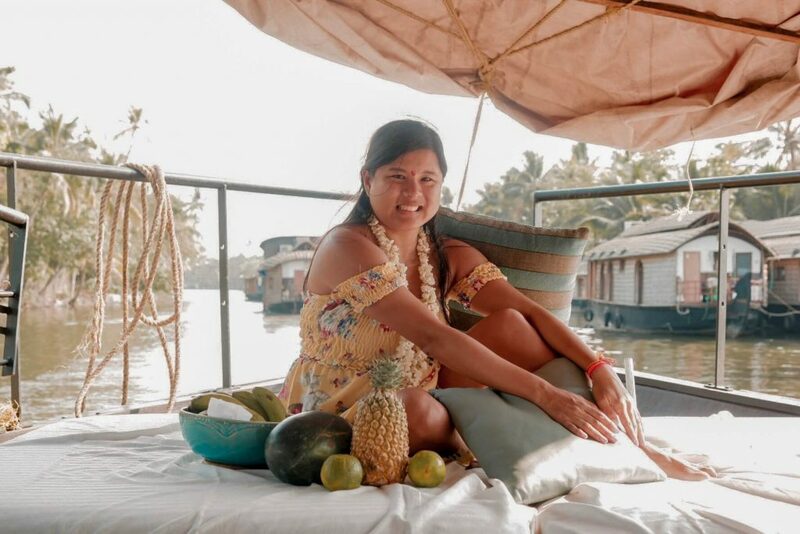 I am from India and although I have travelled to Kerala for work, I never had the opportunity of staying on a house boat in the backwaters. I love your pictures, especially with the red dress. 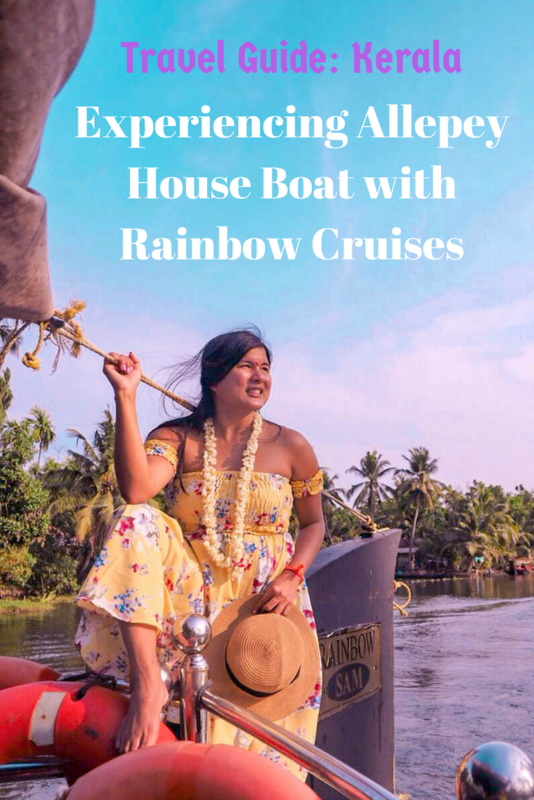 Thanks for all this information about how to get to allepey and choosing the houseboat experience, I did not know there so many classifications of the types of boats but it makes sense, just like you have classifications in hotels (budget, luxury, etc). The experience looks totally worth it, the sunset is amazing! I can see why people in Kerala call it God’s own country. Your photos are absolutely stunning! I especially like the photos of the sunset. And it’s great that your tour guide was so wonderful. I would definitely want to try the boat house experience. I am happy that I was able to encourage you to visit this place. You should make it a point to visit. it’s really very relaxing and so serene. I bet you would love it too. This is a pretty cool experience! I’ve always wanted to ride a houseboat, albeit the more modern version, but I bet it would’ve been nice to ride a kettuvallum. Some great photos documenting your experience! There is always something so nice about being on Raibow Cruise! But don`t you scare to sit inside? Anyway traveling it`s moments that make the life a very special to everybody.